Glur Hostel is a small resort-like hostel located in a peaceful area of AoNang with signature lime stone cliff view. >> 2 persons (1 bunk bed) with private bath, writing table, TV & DVD. >> 2 persons (1 bunk bed) with writing table, TV & DVD. Shared bath. 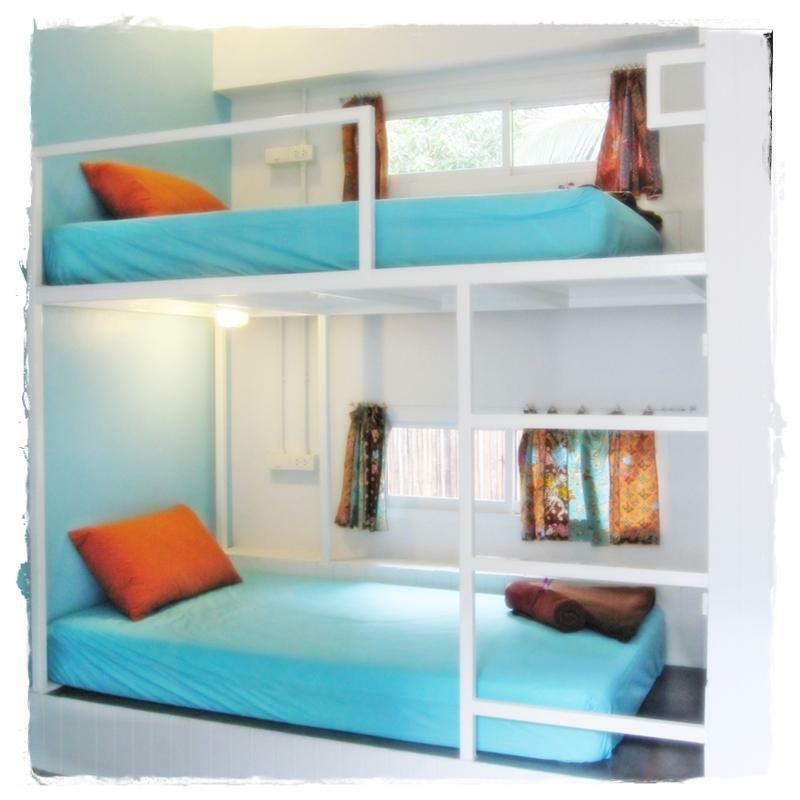 >> 4 persons (2 bunk beds) or 8 persons (4 bunk beds). Shared bath. Each bed has its own private locker with key-lock, hanging closet, reading light, electrical socket, linens and towel. The Shared Bathrooms are separated between men and women (5 showers, 5 toilets in each bathroom), with free shampoo & body cleanser. The Hostel features gathering places like open-air common area with 42'LCD & DVD, small kitchen area with fridge, microwave, hot-cold water dispenser. Free WIFI in room and public area. Free coffee & tea all day. Free drinking water. Free fruit or snacks. Free rental of laptop, portable DVD player, DVDs, beach mats. Glur Hostel is located next to restaurant where you can get breakfast, sandwiches, and coffee. Other local food, convenient store, ATM, and laundry service are only 200-300 meters away. Glur Hostel is located in AoNang area approximately 1.5 kilometers from AoNang Beach and 25 kilometers from Krabi Airport. Transportation from Krabi airport (one way) will be about 150 Baht per person for Shuttle Bus, or 600 Baht (max. 2 persons) for taxi. Transportation from Krabi Town Bus Station (one way) will be about 60 Baht per person for the pick-up type taxi (song-thaew).